Disconnect from the hustle and bustle of everyday life and discover some of the best scenery and wildlife that Costa Rica has to offer. Next to Corcovado, La Leona Área, Carate, Puerto Jiménez, Península de Osa. 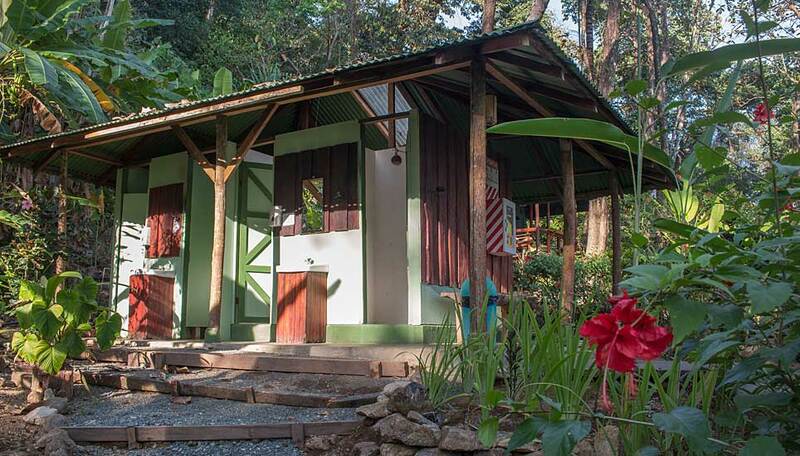 The closest lodge to Corcovado National Park, La Leona is a family-owned and run property in a tranquil setting between the rainforest and Pacific Ocean. Nature’s bounty is clearly evident, with a profusion of plants, flowers and trees, and abundant animal and bird life. Expert guides lead you on trails in the private reserve and the national park to enable you to experience this diversity for yourself, and you’ll have the chance to explore by kayak and on horseback. Having worked up an appetite you’ll enjoy the tasty food served in the open-sided restaurant all the more, and can then adjourn to one of the hammocks in the garden for a well-earned rest. 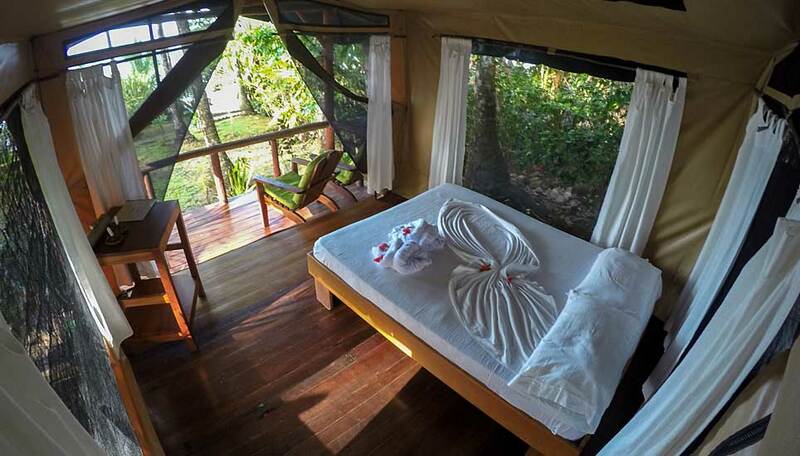 Accommodation is pleasingly simple, in tents set by the beach or in the forest, each with a private deck so you can sit back and absorb the sights and sounds of nature. It’s an immersive experience and one you’ll not forget. 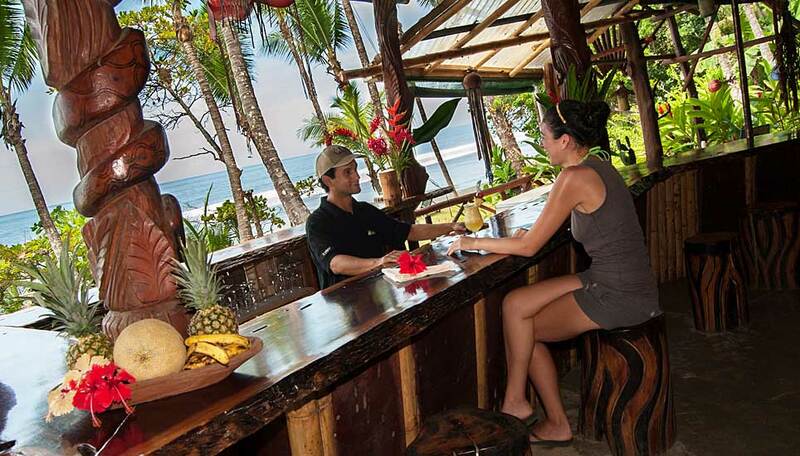 Why go to La Leona Eco Lodge? You stay at La Leona to experience the natural world, without the distractions of modern life. The lodge and its surrounding reserve provide the perfect conditions for photographing, researching and simply watching wildlife. 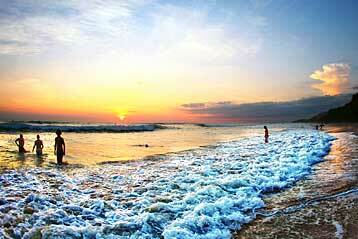 Neighbouring Corcovado National Park is home to 2.5% of the world’s biodiversity – a true paradise for nature lovers. This is also a great place to relax: lie back in a hammock in the gardens or stroll to the beach and let yourself be lulled by the rhythmic sound of waves on the shore, and savour regional and international cuisine in the open-sided Jardines del Mar restaurant. Corcovado and the Osa Peninsula are home of approximately 140 species of mammals, 375 species of birds, 117 species of amphibians and reptiles, and 9000 species of insects, as well as over 2000 species of plants and 700 species of trees. Of these, some 49 species are in danger of extinction, at least 12 of which are unique to Costa Rica. On guided hikes you’ll have the chance to spot many of these including the 4 different species of monkeys, anteaters, scarlet macaws, white nosed coatis, tayras, mountain deer and squirrels. Corcovado also has the most significant populations of endangered mammals, on the Pacific coast of Central America. These include jaguars, pumas, ocelots, white-lipped peccaries, and tapirs. If you’re especially lucky you may even see a puma, tapir or sloth. 24-hour electricity and charging points. Children aged 4 years and over are welcome. Children aged from 4 to 10 years pay 50% for accommodation and meals (with the exception of Christmas and Easter). Those aged 11 years and over pay the adult rate. There is no Wi-Fi internet access and no mobile signal. There is internet access and radio communication for operational and emergency purposes only. 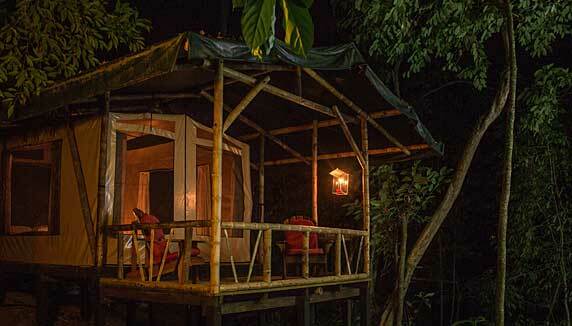 There are 10 ocean view tents, 6 tents with en-suite bathrooms in Monkey Camp and 5 tents with shared bathrooms. All tents have beds with good quality mattresses, bedding and towels, and private decks for relaxation. These tents are located a few metres from the beach. 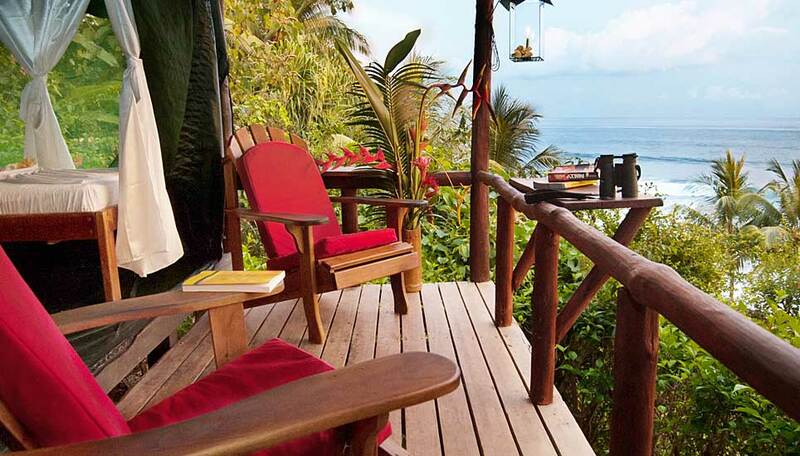 Each has a deck at the front with comfortable chairs and a spectacular view of the crashing waves and colourful sunsets. Each tent is equipped with a bathroom that is open to the sky, so that you practically shower immersed among the trees. 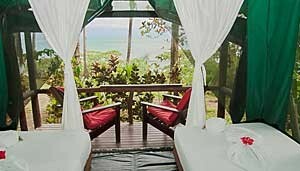 These tents are located behind the ocean view tents, within the rainforest and about a 5 minute walk from the main lodge. They provide the perfect setting for encountering wildlife, as you rest on your front deck enjoying the amazing view of the forest canopy. Each tent has a private, roofless shower room. These are located between the ocean view tents and Monkey Camp. Each tent has a bedroom and a private deck with comfy chairs, similar to those of the other tents. The tents share a clean bathroom and shower facility located nearby.